The Southern Cheyennes were the most to be feared. The Cheyennes have been a great nation. Their men and women are splendidly built, and handsome, and of lighter skin than the Sioux and the Arapahos. They are smart, their lodges are clean, in the old days their horses were the best. As fighters they have ranked very high; they waged terrible war�their losses in battles with the white men have been larger, when numbers are counted, than the losses of the Sioux, the Kiowa or the Comanches. Formerly all the Cheyennes lived together in the north, on the Upper Missouri River and in the Dakotas. They are Algonquians, like the Shawnees, the Sacs, the Blackfeet, the Comanches, and so many others. 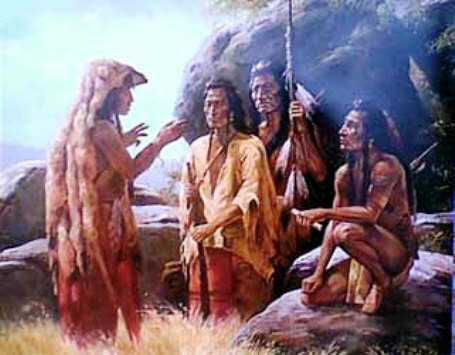 Their name comes from the Sioux name Shai-ena�Strange Speech People; for when they entered the Sioux country nobody there could understand them. In the summer of 1868 the Kansas Pacific had run trains to Sheridan Station, four hundred and five miles from the Missouri River, and had graded to Fort Wallace, ten miles beyond�or fifteen miles by stage. The trail from Junction City had been bloody; the plains Indians were fighting the surveyors and the graders and the train crews and the station hands; it had proved to be a tough job, to build the Kansas Pacific through the Cheyenne and Arapaho country. Matters looked bad indeed. Wagon trains and stages and ranches were being attacked with bullet, arrow and fire; forty and more persons, men and women, had been killed; other women had been carried from their ruined homes into dreadful captivity. The raids covered all western Kansas and southeastern Colorado. The Arapahos and the Sioux were helping the Cheyennes. Sheridan Station, at end of track, had been threatened with a siege�two hundred miles of railroad travel on the Kansas Pacific was being halted, the stages feared to run to Denver, and to New Mexico by the southern trail�Colorado appealed for soldiers at once. General Sheridan proclaimed war. He divided his field force into columns and sent them out. Each man was to be paid one dollar a day; he furnished his own horse�was allowed thirty cents a day for that. He was equipped with canteen, blankets, knife, tin cup, Colt's revolver, and repeating Henry or Spencer caibines. The Henry rifle was like the modern Winchester; the Spencer carried six cartridges in the stock and one in the chamber. They both were good guns. It took only five days to fill the company. He led out from Fort Hays on August 29; scouted to the north, where the Cheyennes had been killing and plundering; and swung in to Fort Wallace�the last of the posts. He had not sighted an enemy. Then at Fort Wallace he heard that a band of the hostiles had stolen horses from the stage company station only a few miles away. The hardy Forsyth Scouts started afresh; left Fort Wallace on September 10. Two of the men were ill and had to remain behind. Now the company numbered forty-eight men and three officers. In a day or two they struck an Indian trail heading for the northwest. They followed it; it split into several trails�an Indian trick. Keeping to one of the trails the Forsyth Rough Riders steadily pursued farther and farther out, clear to the Republican River beyond the northern border of Kansas. The Cheyennes were not far. They had been spying upon the column for five days. Now they had turned�had Colonel Forsyth marched on until evening they would have ambushed him at the upper end of this very valley. They were going to attack anyway. Roman Nose was their war chief. The foolish fifty, cut off by one hundred and ten miles from Fort Wallace and rescue, were to be crushed by seven hundred warriors�Cheyennes, Sioux and Arapahos. The scouts had been almost as quick. They were Indian wise�they had dived for the picket ropes. Only two pack mules and five horses broke away; those horses had been hobbled, in disobedience of orders. The Indians drove the seven before them, up the valley, pursued by bullets.